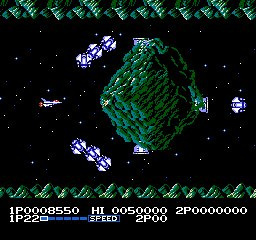 This classic shooter, originally ported to the NES in August 1988, is a spin-off of the seminal Gradius series. 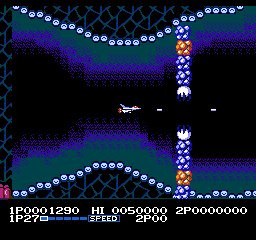 Pilot the Vic Viper through six stages of intense action, alternating between horizontally and vertically scrolling environments, and take on wave after wave of enemies. 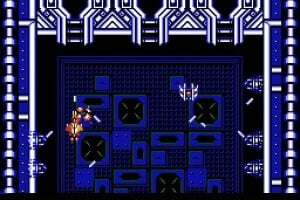 Destroy particular enemies throughout the game (which takes place within the body of an enormous alien) to release power-up capsules and equip your ship with your choice of more powerful weapons, extra speed and shields. Utilize the power-ups carefully, though, as a fearsome guardian lurks at the end of each stage and won't be easily defeated. You can go it alone or bring along a friend to take on the challenge simultaneously. Do you have what it takes to save your planet? Finally. I didn't think it was coming but in this case, i'm glad to be proven wrong. 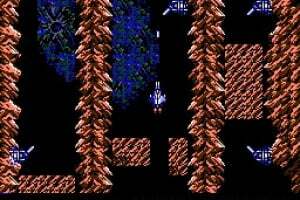 I'm not a huge shooter fan, and I have serious doubts about the quality of a NES shooter. 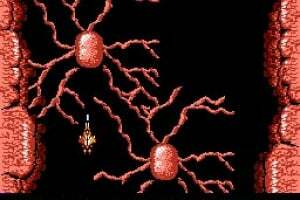 I've played Nes shooters before. 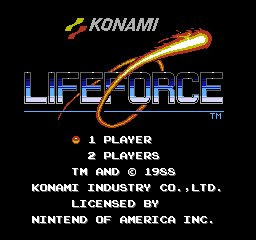 Life Force is one the best on the system and is a great game. I've played a lot of shooters in mylife time including ones on the Atari 2600. 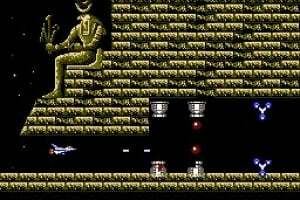 This is hands down the best shooter on NES if not of the entire Genre. Excellent music and creepy bosses. That boss tune is already going through my head just thinking about it. I was wondering when it would come to VC. Looks like it's on the way! 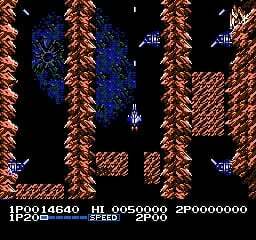 Despite not being too over-enthusiastic with scrolling shooters, I must say that this one looks pretty interesting. I have been waiting for this to come out on the vc. I spent hours & hours playing this game when I was younger. It is FANTASTIC! More shooters, yippie-kay-ya. We can never have enough of those, there still must be some not released on VC. I just don't understand how people can value a game where the "experience" lasts for 10 minutes and then you are supposed to do it all over again. How many hours you really can get out of this? I would argue around 2 and that is optimistic. And yes I am condemning this without ever playing this so I might be wrong. I have a question for shooter nuts: is there ever a reason in these games to take your finger off the fire button (except in the case of busting open an item container)? @WoRMaSTeR: Wouldn't that be the case with platformers too? Not to mention sports games, racing games, fighting games, beat'em ups and puzzlers. Damn, not many genres left in your world. @ 11. Adamant: You are saying that super mario 3 is a ten minute experience or any other platformer for that matter? 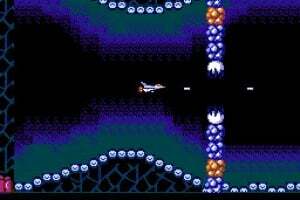 Sport games and beat'em ups are crap (and repetive) unless you play them with friends granted, racing games of the 8 bit-era are crap, but modern games offer a lot more than any shooter out there. At least in good puzzles the scenario changes, so it is a different experience everytime, but in shooters it is allways the same enemy patterns etc. 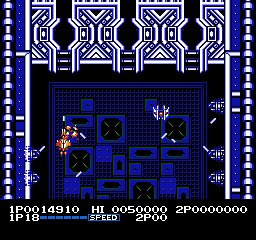 I actually bought a shooter on VC (super star soldier) since it was so highly praised and it was the biggest disappointment to me on VC. I've have played games for 20 years now and I find shooters are allways my least played games on any computer or console. So I guess I just wanted to say could we please have something else than shooters, I mean don't we have enough of those allready? I still hope that this is released since I know there are people that want it. I just don't understand why it is "the top game of the month" for japan. It's kinda like reading about another xbox 360 3rd person shooter, but atleast those are selling. Look at the most downloaded lists, see any shooters? No you don't so I cannot understand why everyone and their mother must release these. @Betagam7 according to Gamefaqs this did come to europe. Might reconsider getting this myself if it means slower music. 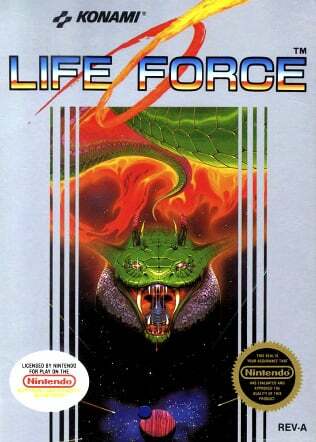 Yep - it was called "Life Force Salamander". Brilliant game, definately going to pick it up once it's released in NA. 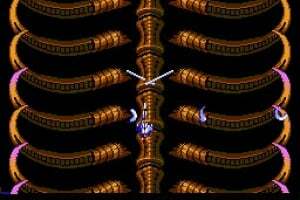 Having recently played some other entries in the Gradius series, I've been thinking about (and waiting for!) 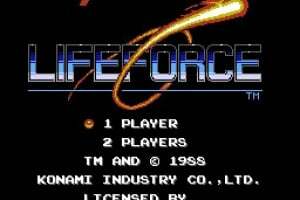 Life Force, and I gotta say, this is hands down the best shooter I played as a five year old NES junkie. 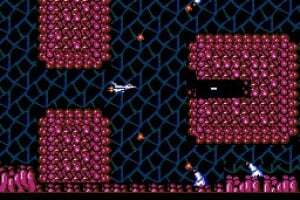 I cut my shooter teeth on Gradius III, renting it so often that my parents would have saved if they had just bought it for me, but this video looks frustratingly hard. Not too fond of shooters in closed spaces either (thank you, Soldner X [PSN], for reminding me). It's annoying to die from hitting walls when the primary game mechanic, shooting, has nothing to do with avoiding ceilings, rocks, and what not. Just feels out of place. Still, there's a surprising lack for co-op shooters on the VC, so I might have to grab this one despite my misgivings. Ah, Nintendo, you have me in your pocket. This game may have the coolest boss music ever! Awesome. 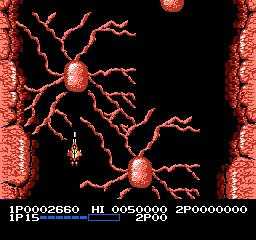 I'm finally getting into the shooter genre, and I'll be getting this, since it looks like the only NES shooter coming to VC that may be worthy of 5 stars. Yay It's finally out! Now my shooter collection is complete. I don't think a better shooter will be coming to VC now that this one's out. One of my favorite nes games ever. 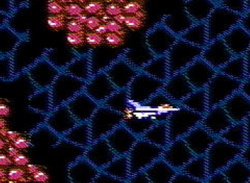 8-bit shooter perfection. Amazing. Love it. Why didn't you give this 5 stars? 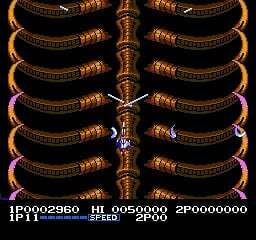 Apart from being a tad on the easy side, you don't get much better than this on the NES. Right looking on youtube it looks like I won't be downloading this after all when it comes to Europe. Why you ask? because we will get the crappy 50hz version which will have unoptimised S-L-O-W-E-R music. You can never have enough Shooters! Now that this game is out, I can finally do NES themed download, alongside Ninja Gaiden II, Tecmo Bowl, and StarTropics! You're absolutely right Mickeymac, you can never have enough shooters. I just wish they'd release Thunderforce III. 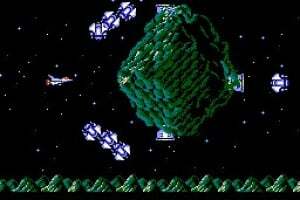 I agree it was a great NES shooter...I owned it for many years and beat it a number of times...but I still think it is quite boring to play through. 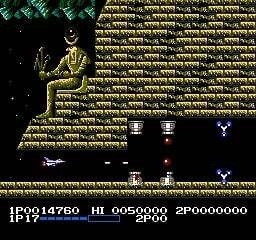 Shooters never looked as good on the NES as they did on later consoles. Wait a second... this game has to be the same as "Salamander" for the C64 ! I hope this does make it to Europe.